and Jill before, when they visited the Houston Police Mounted Patrol facility a few years back. This time, I was able to have lunch with Jill and Jaime in Lompoc and have an excellent talk on horses, horse care and barefoot horses. The passion they both have for horses is amazing and through their passion they continue the never-ending pursuit to gain knowledge in caring for horses. 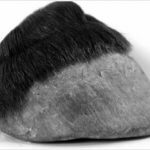 They also continue to correct the misinformation in the world of horses that the so-called experts continue to tell people in regards to the care and treatment of horses, especially hoof care. I was also presented with Jaime’s new book, The Natural Trim, Principles and Practice. Jaime and Jill have put together a very practical way for people to get correct information to care for their horses. This is not only a book that covers in-depth hoof trimming but also covers whole horse care. People can understand that in order to have a healthy and thriving horse that moves and works without metal shoes, that they must have a very principled whole horse approach. After lunch, we travelled a short distance to the location where Jill keeps her horses. We were met at the gate by her four horses at the base of a small mountain, where Jaime and Jill have built a beautiful Paddock Paradise for them. We walked up the trail of a small mountain to the top, and I was shown how their horses move in an environment that produces a lot of movement on rugged terrain. The hay stations were distributed throughout the top, fenced in a way that horses walked around to each station, then back down to get water. Their horses moved a lot, and their bodies, hooves, and minds showed it. At the bottom of the pasture, all four horses waited and enjoyed being with us. They feed their horses at the bottom with a handful of oats and a vitamin and mineral supplement. Occasionally, they will drop oats and Timothy pellets along the track to mimic natural foraging, like wild horses. Both Jaime and Jill showed just as much passion and principle in handling their horses based on natural horsemanship, and not the way humans usually trained and handled horses. Jaime trimmed three of the horses; all were trimmed in a matter of 10 minutes, all stood untied, perfectly still and calm. Jaime Always adjusted the stand for the horse or his equipment, to keep the horse comfortable. Jaime also mentioned the horses had not been trimmed in 5 months, which demonstrated to me that the principles and practices they had in place for the whole horse made barefoot trimming successful. So, I want to compare what we do here with our 33 working police horses. A brief history about us: we started with one barefoot police horse in 2004, and now all 33 horses are without metal shoes. We have 15 different breeds, geldings and mares, ages from 3 to 18, 15.2 hands to 18 hands tall. We have hoof boots available for every horse; most go out on their shifts without boots. We ride 5 to 6 hours a day, sometimes longer depending on assignment. I have been a Houston Police Officer since 1981. I was selected as one of the original members into the mounted unit in 1984 with zero experience with horses. We started with 14 horses, small facilities, and a very traditional way with our police horses. I started asking a lot of questions in the mid 90’s and started to venture out into the world of natural horsemanship during that time. My barefoot journey started in 2002, when I rode my new horse Shadow for the first time downtown in 2004, barefoot during the Super Bowl festivities. After that week, I knew we needed to change. Shadow is still here, healthy, and a true partner—not only in police work, but life. Greg discussing hooves with Jaime as he trimmed 3 of his own horses. 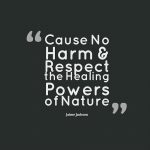 After reading Jaime’s book, I found that we follow his principles and practices of Four Pillars of NHC (Natural Hoof Care). I will cover all four of them, and describe how we follow them without the benefit of a mountain and the rugged terrain of California. The first pillar is Natural Boarding. 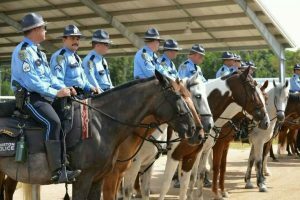 The Houston Mounted Police facility was built and opened in April 2009. The design was structured around the horse and built in a way that maximizes time outside as much as possible, whether they are in the barn or outside in pastures. We operate on 15 acres but have built our “mountain” in a way that maximizes movement and herd involvement. We have 46 stalls, soft bedding inside and a 50 foot run outside each stall with crushed granite for footing. This allows in and out whenever the horse wants, and involves horse play outside. We also allow visitors to visit and feed treats to our horses. This has done wonders for horses that still are unsure about human beings and how they might be treated by them. For the more dominant horses, we will advise visitors to not feed them until they show respect. We do not follow the rule some humans follow about “never” hand-feeding horses. We know every horse is different and needs taming, teaching and training based on the individual horse. We have slow feeders in each stall, which allows the horse to forage more like a wild horse and take smaller mouthfuls, rather than huge bites of hay and oats. In the pastures, we do put horses together and let them sort out the herd details. Yes, our horses come out sometimes with bites and kicks, but we understand that mentally and emotionally this is what is best for the horse, not the human. Our biggest medical treatments now are for bites and kicks, when they used to be for colics and lameness. We averaged 24 colic treatments a year before we started changing to a more principled horse management approach; now we average 1 colic treatment a year. The second pillar is A Reasonably Natural Diet. The Houston police horses have access to hay 24 hours a day. We place the hay in slowfeeders in the barn, and in a Hayhut out in the pastures. Also in the pastures, they can forage on whatever grasses they can find. We do not plant grass, so if they can find and forage any grasses in the pastures, they are welcome to it.We supplement twice a day with a 50/50 mixture of oats and barley, once a day with minerals and salt, and once a day, if needed, with stabilized rice bran for added weight. I ask people who visit, especially horse owners, how much feed do they think we feed a day for 33 police horses, some weighing 1800 pounds. I get answers from 75 to 200 pounds a day. When I tell them we feed 38 pounds of oats/barley a day, they shake their heads in amazement. At one point prior to us going barefoot and pulling metal horse shoes, we would feed our biggest horse 4 pounds twice a day of a bagged commercial feed. With colics, lameness, bloatings, body sores, crests, and other ailments, some of us knew we needed to study what was going on. Once we started on hay all day long and a more natural whole food for horses, all of the ailments stopped. Our biggest ailments now are eye allergies—we have a very dusty barn, but it has nothing to do with what we are feeding our police horses. Our biggest Percheron gets 4 pounds of oats and barley, with most horses averaging about pound a day. beginning horsemanship school for new officers. The 8-week course covers a lot of principles and even includes sessions on barefoot horses. We also have a 4-week intermediate and a 4-week advanced course for the officers, along with training once a month. The last and fourth pillar is Natural Trimming. We have four Officers that do the trimming. We trim with intervals between 2 to 6 weeks, depending on the horse. We follow the principles of the wild horse model when we trim. I went back and checked all of our medical records, starting in January of this year. We have not had one hoof related lameness in 2012. I went back and checked in 2011, we had onehorse x-rayed that showed some low-level laminitis, we adjusted his feed, used boots until his hooves changed, and no more problems. We also had one horse abscess in 2011, we turned him out and waited for it to blow out, which it did, and he was placed him back into service. We think what a lot of people will see is that it is way more than barefoot and pulling metal shoes. One of the successes of Jaime’s Four Pillars of NHC is our police horses working 5 days a week without metal shoes. That is just one success out of many for us that has improved not only the physical health of our police horses, but also their mental health. Our horses are, as Parelli says, “smarter, calmer and braver” because of the changes made to the whole horse, and not because we pulled the metal shoes off of them. We invite anyone to come by and visit us, and bring apples and carrots for the horses. We will also give you a tour, and if interested, can show you how we naturally trim our horses. Just give us some advance notice, so one of the trimmers can be here for your visit. Natural Boarding: here is one of the pastures at the Houston Mounted Police facility, complete with Hayhuts. All the horses have runs on their stalls with crushed granite for footing.A Reasonably Natural Diet: The Houston police horses can forage for whatever grass grows wild in the pastures. This small wheelbarrow is filled with a 1 day supply of grain for 33 working police horses!